If there’s one thing Elvis was known for as much as his music, it’s his love of the peanut butter banana sandwich. 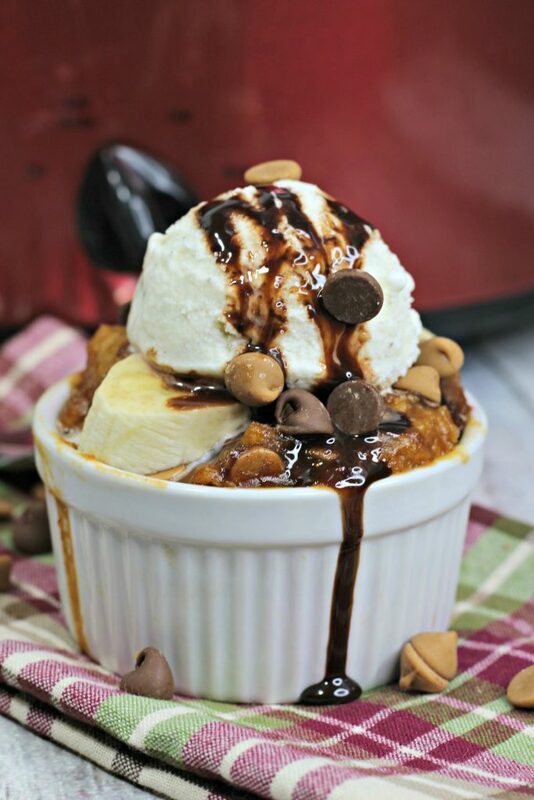 Love it or hate it, this Slow Cooker Elvis Pudding Cake takes his idea and turns it into a sweet treat that’s easy enough for anyone to make & enjoy. It doesn’t hurt that we’ve added a chocolate drizzle and topped it with a crisp scoop of vanilla ice cream. Do you still remember things you loved from childhood? Was there ever anything that stuck out? For whatever reason you just stuck to something. Grabbed hold of it and never let it go? For me, that was The King. The King of rock & roll. Elvis Presley, the man himself. I’ve always been musically inclined. Songs have always spoken to me, like poetry set to tune. His songs may not have been super deep or intense- but they sure spoke to me. Something fierce too. I was only three years old when I announced the SECOND man I would marry. Yes, the second. The first being my Daddy. Apparently, I’d already told him we’d one day be wed. He just hugged me closer and told me we’d see how I felt years down the road. Unlike Daddy though, I didn’t need his approval for my betrothal to Elvis. I was gonna marry him come hell or high water. At age three. Three. I still can’t believe it myself. The home videos and my parents’ testimony though has been proof enough now. I wasn’t even phased when I gently found out I was born well after he had died. That was my future husband, or bust. Fast forward almost thirty years, and my tastes have obviously changed. I’ve found my husband, my king. The Hubs himself gets a chuckle hearing stories about my love for Elvis in my younger years. I’ve gotten a bit more realistic about things sure, but my love for all things Elvis Presley haven’t dimmed a bit. Time couldn’t touch that! I still groove to his music, I’ve made sure all my kids are familiar with his hits. I own all his movies and have made sure they also have a healthy appreciation of those too. It’s my job to make sure they have a healthy appreciation for all things vintage and amazing, right? That’s meant immersing them in all things related, including food. Most infamous being his beloved peanut butter & banana sandwiches. Not surprising since he was from the deep South. It’s a classic combination down here. 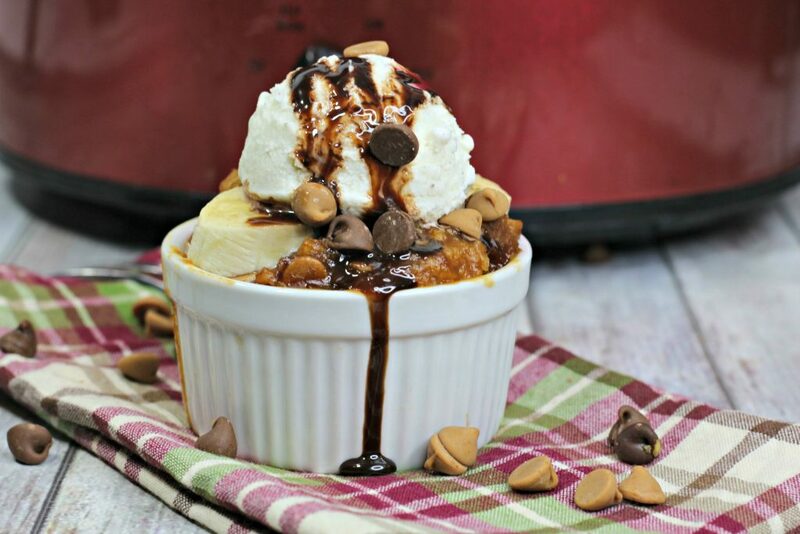 We decided to up the ante, and turn it into a delicious dessert. 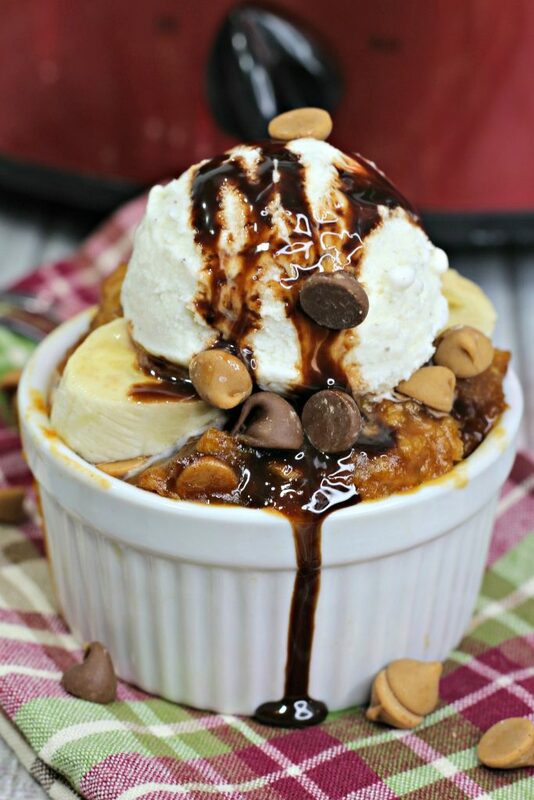 The slow cooker Elvis pudding cake was born. Just like the original, it was also meant to take the world by storm. The stages may not have been the same, but the reception was! This recipe is sure to catch a real stunner. 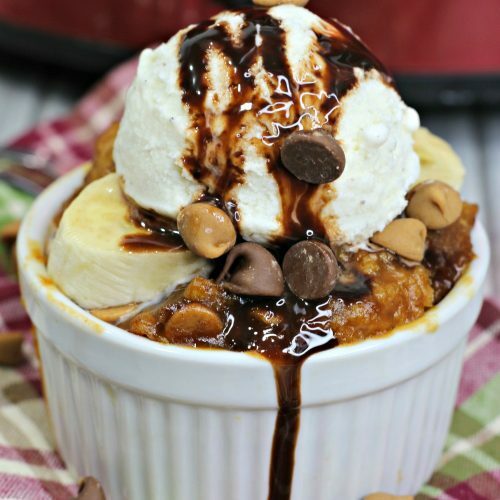 Elvis was always known for his peanut butter & banana sandwiches, but this slow cooked dessert takes them to the next level and turns them into a sweet banana pudding cake based confection. Spray a 6qt slow cooker pot with pam spray. Using a medium bowl, whisk together for 2 minutes the milk and pudding mix until soft. Pour soft pudding into the cooker and set aside. 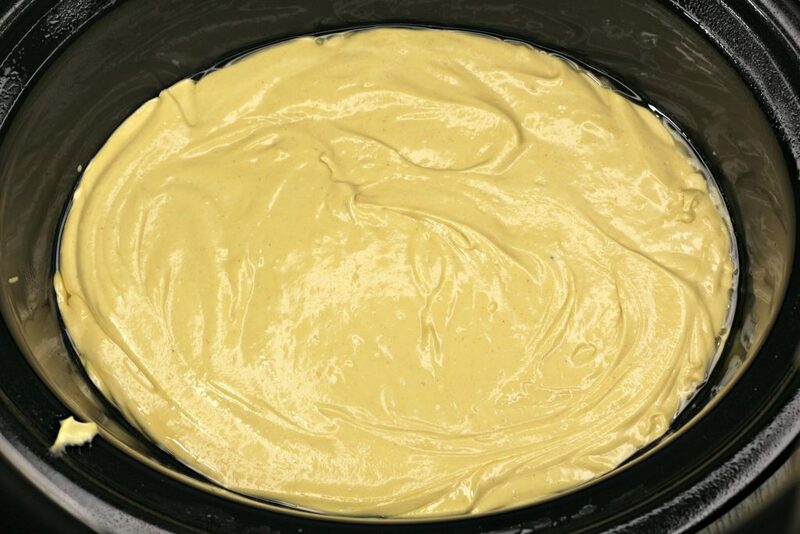 Following the directions on the back of the cake mix box, prepare the cake batter, mixing in the 1/2 C of creamy peanut butter. Bake on low for 4 hours or until a tooth pick comes out clean from being poked in the center. 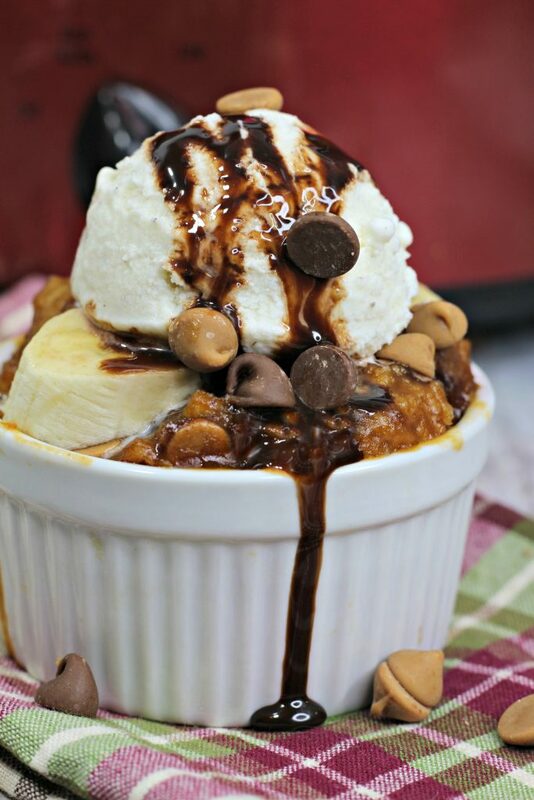 Sprinkle the peanut butter chips and chocolate chips over the top and cover back up with the lid.